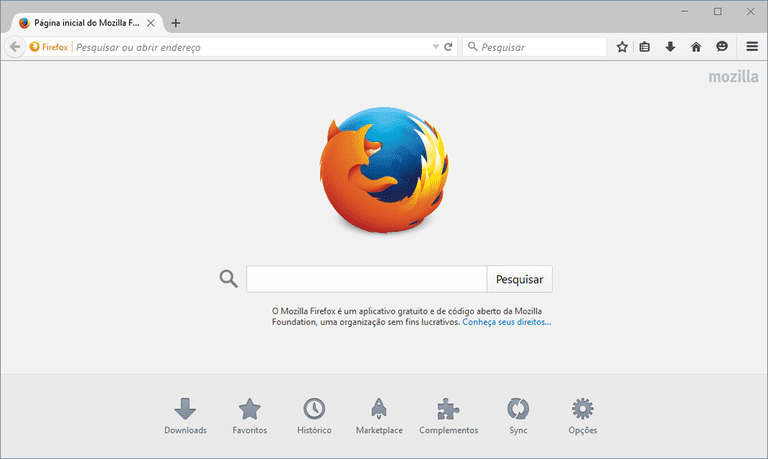 This tutorial is only intended for users running the Mozilla Firefox browser on Windows, Mac OS X, Linux. As the evolutionary progress of the modern web browser continues to move forward, so does the amount of information that gets left behind on your device after a browsing session. Whether it be a record of the websites you've visited or details about your file downloads, a significant amount of personal data remains on your hard drive once you close the browser. While the local storage of each of these data components serves a legitimate purpose, you may not be comfortable leaving any virtual tracks on the device - especially if it is shared by multiple people. For these situations, Firefox provides the ability to view and delete some or all of this potentially sensitive information. This tutorial shows you how to manage and/or delete your history, cache, cookies, saved passwords, and other data in the Firefox browser. First, open your browser. Click on the Firefox menu, represented by three horizontal lines and located in the upper right-hand corner of the browser window. When the pop-out menu appears, select Options. Firefox's Options dialog should now be displayed. First, click on the Privacy icon. Next, locate the History section. The first option found in the History section is labeled Firefox will and is accompanied by a drop-down menu with the following three choices. Remember history: When selected, Firefox records a log of all of your browsing history. Never remember history: When selected, Firefox does not record any browsing history whatsoever. Use custom settings for history: Allows you to customize a number of Firefox's history-related settings, detailed below. The next option, an embedded link, is labeled clear your recent history. Click on this link. The second section lets you specify which data components will be deleted. Before moving forward, it is imperative that you fully understand what each one of these items is before deleting anything. They are as follows. Browsing & Download History: Firefox maintains a record of the names and URLs of all web pages that you visit, as well as a log of all files that you download through the browser. Form & Search History: When you enter information such as your name and address into a Web form, Firefox will save it locally - utilizing it to auto-populate these fields in subsequent sessions. Meanwhile, when you enter keywords in the browser's Search bar, that data is also stored on your hard drive for future use. Mozilla has chosen to group these two components together when it comes to deleting them. Cache: Cache consists of temporary files that are used to speed up page load times on ensuing visits. These can range from image files to entire Web pages. Active Logins: When selected, you will be automatically logged out of any sites that you are currently logged into (via HTTP authentication). Offline Website Data: Some websites may choose to keep files on your hard drive that can facilitate the use of the site even when an Internet connection is not available. These files are classified as offline website data. Site Preferences: Firefox also stores certain settings, such as the allowance of pop-up windows, specific to individual websites. These preferences can also be deleted if you so desire. Each item that is accompanied by a check mark is slated for deletion. Ensure that you have the desired options checked (and unchecked). To complete the removal process, click on the Clear Now button. As we discussed above, cookies are text files utilized by most websites and can be removed in one fell swoop via the Clear All History feature. However, there may be occasions where you want to retain some cookies and delete the others. If you find yourself in this situation, first return to the Privacy options window. Next, click on the remove individual cookies link, located in the History section. The Cookies dialog should now be displayed. You can now view all cookies that Firefox has stored on your local hard drive, categorized by the website that created them. To delete a particular cookie only, select it and click on the Remove Cookie button. To clear every cookie that Firefox has saved, click the Remove All Cookies button. As mentioned above, Firefox allows you to customize a number of its history-related settings. When Use custom settings for history is selected from the drop-down menu, the following customizable options are made available. Always use private browsing mode: When enabled, Firefox will automatically launch in Private Browsing mode. Remember my browsing and download history: When enabled, Firefox will maintain a record of all websites that you've visited as well as files that you've downloaded. Remember search and form history: When enabled, Firefox will store most information that is entered into Web forms as well as keywords submitted to a search engine via the browser's Search bar. Accept cookies from sites: When enabled, Firefox will save all cookies pushed by websites to your local hard drive. Clear history when Firefox closes: When enabled, Firefox will automatically delete all history-related data components each time the browser application is shut down.